Thank you Provost Inch, and good morning Pioneers. I would like to thank Faculty Marshal Baham, Mr. Hendrix Erhahon, Senate Chair Mark Karplus, and Dr. Edward Inch, for joining me on the stage this morning. I appreciated hearing your goals and aspirations for the new academic year and I look forward to working with each of you. In May, Dr. Inch was named Provost and Vice President of Academic Affairs. As Hendrix noted in his introduction, Dr. Inch has extensive experience and a wide ranging skill-set, and is the perfect choice to lead our Academic Affairs division. I look forward to working with him to achieve the University’s goals and continue this institution’s progress towards greatness. I hope that you will join me in making Dr. Inch’s transition to Cal State East Bay a smooth and enjoyable one. Welcome Dr. Inch. I would like to take a moment to publically thank Dr. Carolyn Nelson for her service as Interim Provost and Vice President for Academic Affairs last year. I commend her for the truly outstanding job she did in advancing Academic Affairs, supporting her cabinet colleagues, and providing sage counsel and advice to me. Few understand the scope and quality of her performance as I do. I would ask your help in thanking Dr. Nelson for a job well done. Carolyn, would you please stand and be recognized. Thank you. Before I begin the traditional portion of my convocation speech, I want to take a moment to address the state of the world in which we find ourselves today. As many of us have observed, the world in too many places is troubled and challenged. Too often we are confronted with news of high-profile attacks and too many lives lost in communities and cities across the globe that have the world on edge. Here in the United States, we have been horrified at the loss of life both at home and abroad. These events, occurring with disturbing frequency, cause us to question the security, safety and stability of our democratic society. And yet, we have also experienced and lived through dramatic changes in our society when individuals have the courage and the fortitude to challenge prevailing customs, traditions and beliefs. We have seen sweeping changes in areas of civil rights, women’s rights, disabled rights, and LGBTQ rights as the result of civil discourse. When people are free and able to discuss and present differing opinions, beliefs and attitudes, we become a stronger, safer, and more just society. As educators, we have a responsibility to allow room inside and outside the classroom for passionate debate and disagreement. Occasionally, this can create an uncomfortable or challenging atmosphere; however, at the university, we understand and support the ability of individuals to agree to disagree. Our Collaboration Institutional Learning Outcome states that our students will “graduate with the ability to work collaboratively and respectfully as members and leaders of diverse teams and communities.” The most effective way we can do this is by modeling constructive interactions and respect for each other and not engendering the divisive dichotomy of “us” versus “them.” No matter how uncomfortable and challenging the debate, participants must not fear reprisal, harassment or intimidation for presenting their views and opinions. In order for our students to become socially responsible citizens, they must develop a capacity to listen critically and respectfully to those with experiences and backgrounds different than their own. By championing empathy and openness over dogmatism and intolerance, we protect our collective future and ensure a healthier democracy. I hope each and every one of you will join me in supporting this noble effort here at Cal State East Bay. Now, I welcome you, the Cal State East Bay community, back to campus as we begin our 2016-17 academic year and as I begin my 6th year as your President. I tell everyone I have fun working here and I say to you today, I am excited and looking forward to this coming year. In our university’s short history we have developed a legacy of academic excellence in the Bay Area, California, across the U.S. and beyond. I would like to start by thanking the faculty for all the great work you do for the Cal State East Bay community. You educate our students through multiple methods, you conduct research and remain active in your field to advance in your discipline, you are engaged with our community, and through your work with committees and activities, you serve the university. You are truly outstanding! I want to extend a special welcome to the 30 new tenure track faculty members who are joining the CSUEB family. We have now hired 130 new faculty since I became your President. You join a very distinguished faculty who have brought great pride and recognition to the University. I wish each of you success as you begin your professional journey as part of the Cal State East Bay community. We look forward to your contributions in advancing the University and the success of our students. This past spring, the California Faculty Association (CFA) and the CSU reached a multiple-year agreement and I believe I speak for most of us when I say everyone is pleased at the result. At least, I know I was. As I said repeatedly in the time leading up to the possible strike, the faculty and staff of the CSU were well-deserving of a pay increase. Congratulations on your new contracts! I would like to acknowledge our academic and administrative leaders, as well as the members of the Academic Senate, for all the work they do throughout the academic year in support of the students of Cal State East Bay. I am extremely fortunate to have the opportunity to work with such talented colleagues. Let’s give them a round of applause. I will now introduce to you the members of Cabinet. Would you please rise and remain standing as I call your name? Thank you—you may now be seated. I would also like to recognize other members of our Cal State East Bay family who have assumed permanent or new administrative and staff roles. I would ask those administrators and staff who are here for the first time or have taken on new roles over the past year to please stand, if able, or wave. Please help me welcome and congratulate these colleagues. I would like to introduce my wife, Barbara Hedani-Morishita. She is my greatest supporter, confidant, and critic and takes great pride in this university, you, the students, and all of the faculty and staff. Barbara, would you please stand and be recognized? As is our tradition at Fall Convocation, we recognize individuals who have been honored by the University community over this past year. Dr. Duke Austin, Assistant Professor, Department of Sociology and Social Services, recipient of the Outstanding Scholar on Issues of Diversity, Social Justice and Multiculturalism. Ms. Valerie Taniguchi, Project Excel Counselor, Staff member recipient of the Vivian Cunniffe award. Please join me in congratulating our recipients. Thank you for your valued contributions and congratulations! You may now be seated. Many of us are now veteran convocation participants. In each of the preceding five convocation addresses, I identified new institutional initiatives to address our priorities in responding to internal and external forces affecting higher education. Last year, I discussed the vital impact we have on transforming the lives of our graduates and improving the quality of life in the communities we serve. I noted that as a rising institution recognized regionally and nationally, we are a University ready to soar! My message today is quite simple: the elements necessary for us to soar as a university are now in place. To ensure that we realize this future requires us to reaffirm, support and follow-through on the efforts already underway. Those initiatives include our commitment and dedication to Student Learning and Success; Semester Conversion; Faculty Excellence and Diversity; Strategic Enrollment Management; Fiscal Planning; and Philanthropy. In each of these areas I ask for your individual actions and support to ensure our strong collective future. The first of those initiatives and most fundamental, is our core mission — a sustained institutional commitment to student learning and success. Over the last five years we have been focused on enhancing the student experience, and how we engage students in multiple learning environments, including service learning. These initiatives allow us to envision a future for the university that includes the continued excellence of our academic programs and student services. Most importantly, thanks to the strong partnership and collaboration between the divisions of Academic Affairs and Student Affairs, we are transforming Cal State East Bay. Over the last five years we have been closely examining our programs, services, policies and practices that affect the ability of our students to graduate. We did this because our graduation rates were unacceptably low. At no time in our discussions have we mentioned lowering standards or rigor; rather we have focused on improving the ability of our students to make timely progress to their degrees. Within the CSU, the Board of Trustees has adopted the 2025 Graduation initiative which includes a number of policies and practices focused on increasing student success and graduation rates, and the elimination of the achievement gap of underrepresented minority students. Accordingly, many of our existing programs already directly address the requests of this initiative. I would like to take this opportunity to thank you, everyone, for all of your efforts and work, as they have resulted in higher persistence and graduation rates. The Fall 2010 FTF 6-Year graduation rate is 47% — an improvement of over 8% from the Fall 2008 cohort. The three year graduation rates for Fall 2013 entering Transfers was 62.8% (an improvement of 1.4% from the 2011 cohort). While we are headed in the right direction of the goals I laid out 3 years ago, 60% for FTF, 70% for transfers, our graduation rates for underrepresented minority students are, however, still unacceptably low compared to their peers. We need to continue and expand our efforts to ensure that all of our students succeed at similar rates. In support of these advances, the upcoming year will focus attention on harnessing predictive analytics, updating current advising software, and focusing on program mapping and tracking. The goal is to find appropriate pathways for student success initiatives that will allow us to shift from cohort based approaches to individual student interventions that predict and prevent certain student failures before they happen. We expect that the outcomes from these efforts will be increased retention and graduation rates, reduction in under-represented minority achievement gaps, shortened time to degree, and a decrease in excess student credits. As students start lining up for office hours or stopping by for advising, I would ask each of us to take a moment to consider how our interactions impact our students and how we can improve their experience. Work is progressing smoothly with the Semester Transformation—indeed, it is hard to believe it is only two years away. At this time, I would like to take the opportunity to acknowledge and thank the past co-directors of the Office of Semester Conversion, Dr. Eileen Barrett and Dean Jason Singley, who have led this initiative since its inception. Under the leadership of Director Michael Hedrick and Associate Director Lindsay McCrea, Semester Transformation will continue in good hands. This tremendous effort has required the collaboration, goodwill, and extremely dedicated work of many and I am grateful to all for your contributions on the committees, subcommittees, and numerous other task forces devoted to Semester Transformation. Last year, we began the enormous task of revising the curriculum, with a complete review of all academic degree programs and courses. This important work will continue throughout the next academic year and is expected to be completed in 2017. Beginning this fall, the focus of Semester Conversion will center on Student Academic Advising. Numerous efforts are underway to ensure a smooth transition for all students currently enrolled, particularly our juniors and seniors. The message to our students, reinforced by faculty and staff alike, is to “Make Every Class Count.” Now more than ever, it is critical that each of us help our students ensure they are on the correct pathway to graduation. All of us must take the time to reach out to every student who looks a little lost, or the students who are struggling in the first weeks of classes, and help them navigate the many resources offered at Cal State East Bay. If we plan to meet our goal of improving retention and graduation rates, then providing the information students need to graduate in a timely manner, particularly for those who can do so in the next two years, is critical. Helpful tools such as Bay Advisor, our new advising platform currently being piloted, degree audit reports which allow students to track their academic progress towards their degree in MyCSUEB, semester conversion guides, and additional materials will be made available, as well as workshops and other training. The most up to date resources are available now on the Semester Conversion website. I encourage each of you to become familiar with all these tools, because while in your day to day job, you may not directly advise students, as members of the university community, all of us have a responsibility to uphold the promises we made in the Pledge to our Students regarding not adversely affecting their time to obtaining a degree. Only by working together as a university can we ensure no students fall through the cracks during this busy time. Central to understanding how we are enhancing our students experience here at Cal State East Bay, and how we engage students in formal and informal learning environments, is the acknowledgement of the importance of faculty excellence and faculty density. This critical initiative allows us to envision a future for the university that includes the continued excellence of our academic programs. Since my arrival at the University, I have focused upon the need to build back the number of tenured/tenure track faculty. Increasing the number of faculty from 290 in Fall 2011 to our goal of 350 by 2018 enhances the undergraduate and graduate academic experience in several ways: 1) ensuring the availability of course offerings to meet student demand and decreasing class size as appropriate; 2) increasing opportunities for student-faculty engagement; 3) supporting undergraduate and graduate research; and 4) stabilizing our student-faculty ratio. Increasing the number of tenured/tenure track faculty also boosts the University’s growing research promise. As was mentioned earlier, we hired 30 new faculty members this year. I am pleased to report that the gender breakdown for new tenure track hires is 57% female (53% of whom are minority) and 43% males (54% of whom are minority). We have raised the total number of tenured/tenure track faculty to 330. This year, I have authorized the Provost to conduct 30 additional tenure track searches. We are hopeful that we will attain our goal of 350 in the next two years. Hiring and maintaining a diverse faculty is essential to our academic excellence at Cal State East Bay. But as you know, on our campus, diversity is more than ensuring our student, faculty and staff population are representative of our region. Diversity at our university means that we actively recruit and hire faculty to embrace the contributions of a wide-range of individual backgrounds, academic perspectives, and analytical frameworks to scholarship and learning to build a respectful, inclusive community of successful graduates. I am very proud of our diversity at CSUEB and I want us to continue to emphasize the importance of meeting the educational needs of the diverse population of students we serve. I am especially proud when I tell people that CSUEB has been ranked by the Chronicle of Higher Education as the most diverse public university in the continental United States, three years in a row. Further, I am very pleased to report that for the third straight year, Cal State East Bay has also been awarded a coveted Higher Education Excellence in Diversity (HEED) award from “INSIGHT Into Diversity” magazine. Given the rigor of the qualifications required, receiving this award is especially meaningful and significant. Cal State East Bay just finished its most recent academic year with the highest enrollment in its history — 15,528 students. We continue to meet, and in some cases exceed, our enrollment target, despite reducing the application window time and prioritizing the admittance of only those students who are fully academically qualified. As we look to the future, we must be more strategic and intentional in our enrollment management planning to ensure our institutional viability and success. My charge to the Provost, CFO, and Vice President for Student Affairs last year was to begin developing a multiyear strategic enrollment plan to align the University with current and expected fluctuations in student demographics and workforce needs that will guide our enrollment policies, procedures and practices into the future. As part of their work, members of our Strategic Enrollment Management Committee will engage our educational community in this planning process to achieve our goals. In the recruitment and admission of students, our objective is to provide access and excellence as well as enrolling and graduating a high-quality and diverse student population. To accomplish this goal, we are developing a multiyear recruitment plan that increases the diversity of both resident and international applicants, continue HSI and AANAPISI designated status, and maintain an inclusive student body with a balanced mix of undergraduate, graduate, first time freshman/transfer, and online student populations. In addition, we are addressing fluctuating enrollment targets through advocacy for multiyear planning, an enhanced scholarship program through advancement activities, and partnerships and affiliations with K-12 school districts, community colleges, and other programs to achieve our enrollment goals. We begin this academic year with the addition of new resources and, consistent with the governor’s long-term plan, the CSU will receive an increase of $154 million in the system’s budget. These funds are earmarked for compensation increases, enrollment growth, mandatory cost increases, and student success initiatives. The Governor’s budget once again strongly emphasizes the importance of timely degree completion in all of the state’s higher education segments. With the increased funding, Cal State East Bay will be able to better serve students and meet the educational needs of more Californians. However, even with the additional funding, the budget still falls $87 million short of the $241 million requested by the Board of Trustees. Thus after budgeting funds for sections to meet enrollment growth, the bargained compensation increases, student success initiatives, mandatory cost increases, and bargained contractual obligations, there are no discretionary funds available for any other new permanent programs or initiatives this year. As you may recall from past lean budget times, this is not a new situation for our university and I am confident that as in years past, we will be able to adapt and grow even within these constraints. This academic year, for compensation increases above the two percent supported by the Governor's budget, the CSU will utilize one-time system wide funds to cover two percent of the additional costs and campuses are expected to cover an additional one percent permanently from campus resources. The CSU Board of Trustees will be seeking a budget for the 2017/18 fiscal year that will cover all bargained compensation agreements, increases in enrollment, provide for mandatory cost increases and further support student success. The request will significantly exceed the increase that the Governor wants to support from the General Fund. Without the support of the increase being requested, the CSU could encounter some very difficult decisions about how to fund all the expenses that we believe are mandatory and essential in 2017/18. Clearly, the CSU must be successful in garnering additional state support in 2017-18 to help permanently fund our budget needs including the much deserved compensation adjustments. We must all work together to convince the Governor and our Legislators of the importance of fully funding the CSU Trustees' budget request for the 2017/18 fiscal year. I ask all of you to join me in going to Sacramento next spring to do so. As I mentioned earlier, in the very near future we will have to make some key decisions about enrollment growth. Enrollment growth is the primary funding mechanism through which the campus can capture additional state dollars to enhance student success. However, with increased growth and a flat budget come some difficult challenges. The campus may have to adopt creative strategies to meet enrollment demand, while maintaining our distinctive academic quality. All of us should be prepared for challenging budget times ahead, especially as we look to 2017-18. It will be essential that we plan for these contingencies to minimize their effect on our ability to deliver on our university mission. Going forward, in order to further our mission and soar as a University, increasing our recognition and support will be critical. Last year I said “people are talking about us.” I provided the growing evidence that we are being recognized not only regionally, but nationally — for the excellence of our programs, success of our alumni, the quality of partnerships in the communities we serve, and the expanding role and influence of the University. University Advancement under Vice President Hauck’s leadership has put into place a new team. Over the last two years, we moved from a 100% vacancy of all fundraising positions to full staffing in development. This year, with a robust team in place, the division increased its total number of major gifts and donors in 2015-16. The university raised $4,427,311 — 98.4% of our goal. This year we are prepared to launch a new branding strategy and announce the public phase of our first ever comprehensive campaign. We have been building toward this moment for almost 60 years. From our roots in 1957 as the State College of Alameda County with 300 students to our position today as a leader in our region with more than 15,000 students, “the journey to here” has been one of hard work and filled with success. But the journey “to there,” to our future, is what is exciting. We are on the cusp of creating and sustaining the people, place and purpose that will shape the educational, economic, and cultural landscape of the East Bay and beyond for generations to come. Our importance and impact on our region’s economic vitality, quality of life, accessibility, and social justice is irrefutable. The time has come for others to more fully appreciate our role in this region. Cal State East Bay is ready to share its story: how we got here, where we are headed and why we matter. And by telling our compelling story, we will build additional support and resources, so we can do even more. So here we are: we have staked our claim as “The East Bay’s University.” This fall, we are launching our first major branding campaign that will introduce Cal State East Bay and tell our story to the broader community. Our Message: we are “Rising in the East,” and our ascent means great things for both us and those around us. This branding campaign supports the first significant and comprehensive fundraising campaign in our 60 year history. So it is only fitting that our financial goal is to raise $60 million by the end of June 2019. The good news: we have already raised more than $34 million during the “quiet phase,” working behind the scenes with donors and alumni before publicly announcing our goals and plans. This Saturday, September 24, we are hosting a “coming of age” event at our Campaign kick-off. The event has been underwritten by generous donors who believe in our work and in our even greater potential: corporate partners, the alumni association, campus vendors, the University Foundation, and numerous individuals have all stepped up to make this possible. A portion of the proceeds from ticket sales will go to fund 60 scholarships of $1,000 each — another way to celebrate our 60th anniversary. I hope as many of you as possible will attend, because this is an event unlike any we’ve experienced at Cal State East Bay: Alumnus JR Havlan, the eight-time, award-winning Emmy writer for the Daily Show, will serve as Emcee. Our keynote presenter will be Peter Guber, co-owner of the Golden State Warriors, the LA Dodgers and Mandalay Entertainment, as well as a best-selling author. Peter Guber is a champion of the power of storytelling to affect change and motivate others, which is why the program will focus on success stories of our students and graduates. But wait — there’s more. That evening, two of the largest digital billboards in the Bay Area will light up on the Bay Bridge, going East and West, featuring our Rising in the East campaign theme and highlighting our students. Soon, the campaign will be seen on the sides of buses, in BART stations, in newspapers, and on-line. We are launching a new University website, and you may have noticed the new campaign banners across campus and the murals that highlight the message. We truly are a University on the Rise, and we have organized our fundraising around three pillars that are integral to that ascent: People, with a passion to pursue a Purpose, in a Place that makes it possible. Here are some of the highlights of what a focus on these pillars will mean to the University. People: We are raising funds so we can invest in our core: students, faculty and staff, including endowed professorships, a new Professors of Distinguished Practice initiative, and the Project HOPE (Helping our Pioneers Excel) program, for students who are homeless, food insecure, or financially unstable. Place: We are also raising funds to create spaces that inspire learning, collaboration, and exploration. Part of the $34 million raised will go towards upgrading our campus facilities and creating experiential, collaborative learning spaces. Purpose: As always, we will pursue innovative and substantive ways to connect our students and our work with the greater community, building relationships, leadership, stewardship, and trust. This includes our Hayward Promise Neighborhood initiative, STEM Education programs, and facilitating new ways for students, faculty, community, and business to innovate together and solve real world problems, by breaking them down into manageable, actionable projects. To bolster our recognition and support from the community, it will be essential that on our campus our Deans, college development directors, and yes, the faculty and staff in every department support the effort in raising private funds. As individuals, we can all help in a variety of ways by strengthening relationships with our former students, by sharing our individual contacts in the community, and by integrating our partnerships with area businesses and organizations. Our message is clear and the time is now to work together in telling the Cal State East Bay story. I have asked you at different points this morning to take personal action towards ensuring our success as a University, to strengthen our reputation and place in the East Bay. The specific request to you is quite simple. I am asking you to take pride in and celebrate our considerable achievements. I am asking you to tell others about our work. And I am asking you to help spread the incredible message about the excellent education our students receive, our commitment to student learning, and how we benefit our community, the Bay Area, California and beyond. Cal State East Bay students walk through our doors and into our classrooms, with hopes and dreams of improving their lives and the lives of their families. What I ask for is your continued dedication and commitment so that each one succeeds. 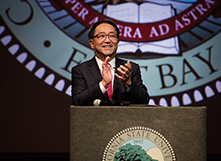 By working together, I envision a Cal State East Bay that will be greater than we have ever been, limited only by our imagination of what can be. Our University Motto, Per Aspera Ad Astra — Through Adversity to the Stars — appropriately describes our Pioneer spirit and where we are headed. The choice is yours. The choice is ours. I wish for each of you a productive and successful year. It is time for us to soar ever higher! Thank you, and Go Pioneers!